Wilson manufactured the Capitals jerseys from their first season, 1974-75 until the 1978-79 season. Over this time, the jerseys did not change very much and they are very difficult to determine the exact year. 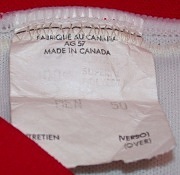 The Wilson jerseys did not have any external tagging, just a manufacturer's tag in the neck, which did change over time. 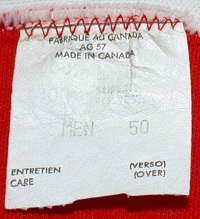 However, the tags were not always the same from one jersey to another, even in the same year. For the 1979-80 season, the Capitals switched from Wilson to Maska jerseys. They would use the Maska-labeled jerseys through 1982-83. Maska jerseys started as a durene-like jersey in 1979-80, but then in 1980-81 they became a solid polyester knit that was very light and is characterized by tons of repairs. For 1981-82 the material became heavier and slightly more durable. 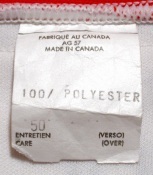 Maska jerseys have a manufacturer's logo on the back hem. In 1983, the owner of Maska and GC Knitting in Quebec, purchased the CCM hockey line from a company called Procycle. 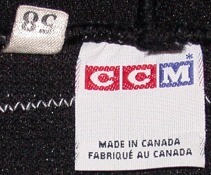 Beginning with the 1983-84 season, the Capitals jerseys were tagged with the CCM logo. 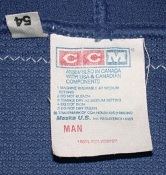 For the 1983-84 and 1984-85 seasons, the jerseys were given the CCM label on the right rear hem and had a CCM neck tag. Beginning with the 1986-87 season and running through the 1988-89 season, the Capitals jerseys were given a three-color CCM tag on the right rear hem and a Maska tag in the neck. In the middle of the 1989-90 season, the CCM logo was changed to two colors and the NHL shield was placed to the right of the CCM logo. The two-color CCM logo remained on the tail of the jerseys along with the NHL shield through the 1999-2000 season. In November 1998, CCM acquired Sports Holdings Corp., and their Jofa, Koho, Canadien, Heaton and Titan brands to become The Hockey Company. Although the manufacturing of the jerseys did not change, the road jerseys for the 2000-01 season were tagged with the Koho logo. The home jerseys retained the CCM label. Instead of the logo being on the right rear hem, they moved to the back of the collar, just above the nameplate. In April 2004, The Hockey Company was purchased by Reebok and all Capitals jerseys beginning in 2005-06 were tagged with the Reebok logo.